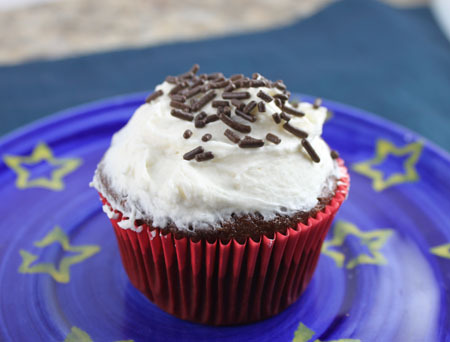 Quick Chocolate Cupcakes with a frosting that does not call for powdered sugar. Preheat oven to 350 degrees F and line 12 cupcake cups with paper liners. Mix together milk and lemon juice and set aside to curdle. egg, vanilla, salt, and baking soda until well blended. Beat in cocoa powder. With a large mixing spoon or rubber scraper, stir in the flour alternately with the milk until flour is absorbed. degrees for 25 minutes or until a toothpick inserted comes out clean. Cool in pan on rack 20 minutes. Remove to platter to continue cooling. Whisk the flour and milk together in a small saucepan. Cook over medium heat, stirring until it starts to thicken. Cook 1-2 minutes more. Turn into a dish and let cool. Beat together the butter and sugar, then beat in the cooled roux 2T. at a time. Continue to beat until frosting turns creamy rather than grainy. This takes a while – probably 6 to 10 minutes. Add vanilla and salt and mix until light and creamy. Frost immediately. You can keep the frosted cupcakes in the refrigerator and let them come to room temperature before serving. I also left a few in a sealed container at room temperature overnight and they were fine.